The average person has about 60,000 thoughts a day and 80% of these thoughts tend to be negative. 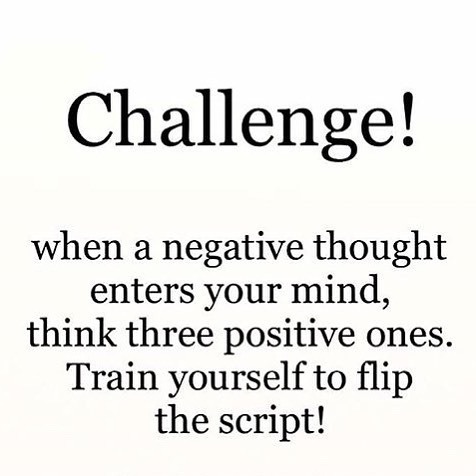 This means, if you don’t consciously train your mind, you will rather think “DISASTER” than “CHALLENGE”. How detrimental do you think this is to your overall life experience? Do you want to hear my secret how I shut up this little voice in my head? Years ago I constantly put myself down. Thoughts such as “I am not smart enough”, I am not good enough”, “I am not talented enough”, “I don’t speak English well enough”, were constantly racing through my head. This means that I recognize my thoughts and consciously change my thought process. Your brain is like a computer and the input is your choice. Tell yourself what you are instead of what you’re not. Like with anything that you would like to learn, it takes practice, determination and perseverance. You gotta work at it. Your mind is a powerful thing. Use it! Do you take on my challenge?